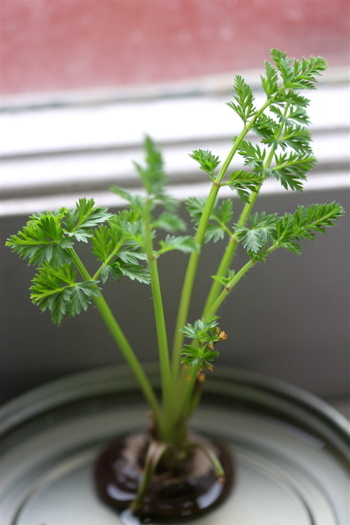 This is what I like to call a Carrot Bonsai it is just the top of a carrot cut off and put in water. I was using some carrots that had been in the fridge for a little while and had started to sprout little anemic shoots from the tops where I had broken off the greens. I thought, hmmm, that's kind of interesting, I wonder if they will continue to grow. So, I just cut off the tops like I always do, and then stuck one into a jar top with some water on my window sill, and after a few days I had what you see above. A nice little bit of green for a long cold gray winter. It seems to work with any carrot top - give it a try! So strange to me that a carrot would do this. I wonder what would happen if I planted it? Hmmm, perhaps I will. First, they have to last until spring - or at least 'til I get out my gardening junk to start seeds. Very clever, and cute! I'm going to try it, the more green the better these days. Brrrr. I'm going to try it too! I see a flickr group in Carrot Top's future. Carrot Top. Ha! I wish I had even a smidgen of your green thumb. I wish that even just my fingernail was green. Instead I kill anything that thrives on manure. That's a cheery sight for a windowsill. I'm so ready for winter to finally wrap up and get the heck out of here.